The reputation of Kitson Plumbing Group is built on the valuable experience of over 40 years. 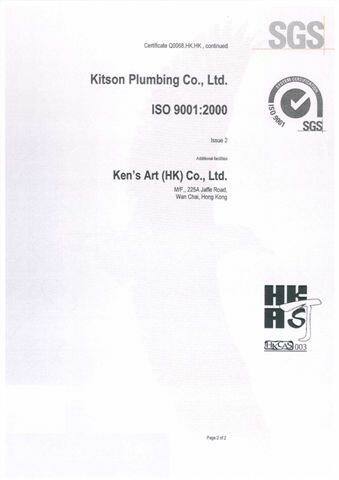 We care our clients and know that you concern the progress and quality of work. Therefore, we have adopted a quality assurance policy which fulfills the international standard and statutory requirements. 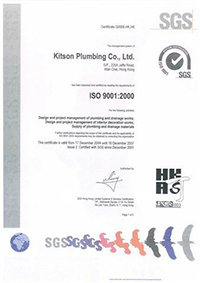 In the beginning of 21st century, we had been awarded the ISO9001-2000 Certificate. Kitson Plumbing Group aims at delivering design installation and maintenance works with customers’ satisfaction at best price. We also aim at minimizing the energy use and improving the safety record. Total client satisfaction is our purpose. In order to achieve this, the procedures and risk factors of each work are defined. Precautions and solution are also found according to each risk. With these guidelines, the probability of fault is greatly reduced and we are able to deal with different situation. In addition, we provide continuous advancement of people and technology. With the continuous improvement, we are no doubt to provide you with the best services. Our own Environmental Policy and Safety Plan have also been established. We have minimized harmful effects on the environment caused by its activities and use energy and materials more efficiently.